MOALLEMI KHIAVI, A. , FARHADI KANGARLU, M. , DAIE KOOZEHKANANI, Z. , SOBHI, J. , HOSSEINI, S. H.
Nowadays power converters play an important role in power system and industrial centers. One of the most important and widely used types of conversion is DC to AC conversion that is also called inverters. Generally inverters are divided to voltage source inverter (VSI) and current source inverter (CSI). From another view the inverters are divided to two-level and multilevel types. The multilevel inverters are attractive because of their good output waveform quality. However, there has been less attention to multilevel current source inverter (MLCSI) when compared with multilevel VSI. In this paper, a new topology for MLCSI is proposed. The proposed topology employs reduced number of switches to generate desired multilevel output current. The proposed MLCSI is capable of balancing the currents of the inductors that are used in the MLCSI structure. A multicarrier PWM based switching strategy is also proposed for the MLCSI. The simulation results using PSCAD/EMTDC as well as the experimental results from a single-phase 5-level CSI laboratory prototype demonstrate its validity. R. H. Wilkinson, T. A. Meynard, and H. du T. Mouton, "Natural balance of multicell converters: the two-cell case," IEEE Trans. Power Electron., vol. 21, no. 6, pp. 1649-1657, Nov. 2006. B. P. McGrath, and D. G. Holmes, "Natural current balancing of multicell current source converters," IEEE Trans. Power Electron., vol. 23, no. 3, pp. 1239-1246, May 2008. B. Wu, J. Pontt, J. Rodríguez, S. Bernet, and S. Kouro, "Current-source converter and cycloconverter topologies for industrial medium-voltage drives," IEEE Trans. Ind. Electron, vol. 55, no. 7, pp. 2786-2797, Jul. 2008. J. Rodriguez, L. G. Franquelo, S. Kouro, J.I. Leon, R.C. Portillo, M.A.M. Prats, and M.A. Perez, "Multilevel converters: An enabling technology for high power applications," Proceedings of the IEEE, vol. 97, no. 11, pp. 1786-1817, Nov. 2009. M. Farhadi Kangarlu, E. Babaei, "A generalized cascaded multilevel inverter using series connection of submultilevel inverters," IEEE Trans. Power Electron., vol. 28, no. 2, pp. 625-636, Feb. 2013. Y. W. Li, M. Pande, N. R. Zargari, and B. Wu, "DC-link current minimization for high-power current-source motor drives," IEEE Trans. Power Electron., vol. 24, no. 1, pp. 232-240, Jan. 2009. Y. W. Li, M. Pande, N. R. Zargari, and B. Wu "An input power factor control strategy for high-power current-source induction motor drive with active front-end," IEEE Trans. Power Electron., vol. 25, no. 2, pp. 352-359, Feb. 2010. E. P. Wiechmann, P. Aqueveque, R. Burgos, and J. Rodríguez, "On the efficiency of voltage source and current source inverters for high-power drives," IEEE Trans. Ind. Electron., vol. 55, no. 4, 1771-1782, Apr. 2008. S. Castellan, G. Sulligoi, and A. Tessarolo, "Comparative performance analysis of VSI and CSI supply solutions for high power multi-phase synchronous motor drives," in Proc. SPEEDAM, 2008, pp. 854-859. A. R. Beig, and V. T. Ranganathan, "A novel CSI-fed induction motor drive," IEEE Trans. Power Electron., vol. 21, no. 4, pp. 1073-1082, Jul. 2006. L. B. Perera, N. R. Watson, Y. H. Liu, and J. Arrillaga, "Multilevel current reinjection self-commutated HVDC converter," IEE Proc.-Gener. Transm. Distrib., vol. 152, no. 5, pp. 607-615, Sept. 2005. Y. H. Liu, J. Arrillaga, N. Murray, and N.R. 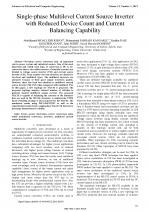 Watson, "Derivation of a four-quadrant control system for MLCR-HVDC conversion," IEEE Trans. Power Del., vol. 24, no. 4, pp. 2223-2231, Oct. 2009. B. Sahan, A. N. Vergara, N. Henze, A. Engler, and P. Zacharias, "A single-stage PV module integrated converter based on a low-power current-source inverter," IEEE Trans. Ind. Electron., vol. 55, no. 7, pp. 2602-2609, Jul. 2008. J. Dai, D. Xu, and B. Wu, "A Novel control scheme for current-source-converter-based PMSG wind energy conversion systems," IEEE Trans. Power Electron., vol. 24, no. 4, pp. 963-972, Apr. 2009. B. Singh, R. Saha, A. Chandra, K. Al-Haddad, "Static synchronous compensators (STATCOM): a review," IET Power Electron., vol. 2, no. 4, pp. 297-324, 2009. F. M. Antunes, Henrique A. C. Braga, and I. Barbi, "Application of a generalized current multilevel cell to a current source inverter," IEEE Trans. Ind. Electron., vol. 46, no. 1, pp. 31-38, Feb. 1999. Y. Xiong, D. Chen, S. Deng, and Z. Zhang, "A new single-phase multilevel current-source inverter," in Proc. 19th Annual IEEE Applied power Electronics conf. and exposition, California, USA, 2004. pp. 1682-1685. Y. Xiong, Y. Li, Z. Zhang, and K. Wei, "A new three-phase five-level current-source inverter," in Proc. 20th Annual IEEE Applied Power Electronics conf. and exposition, 2005, pp. 424-427. Z. Bai and Z. C. Zhang, "Conformation of multilevel current source converter topologies using the duality principle," IEEE Trans. Power Electron., vol. 23, no. 5, pp. 2260-2267, Sept. 2008. E. Babaei, S. H. Hosseini, and G. B. Gharehpetian, "A new topology for multilevel current source converters," ECTI Trans. Electrical Eng., Electronics, and Communications, vol. 4, no. 1, pp. 2-12, Feb. 2006. P. C. Loh, F. Blaabjerg, C. P. Wong, and P. C. Tan, "Tri-state current source inverter with improved dynamic performance," IEEE Trans. Power Electron., vol. 23, no. 4, pp. 1631-1640, Jul. 2008. P. Cancelliere, V. D. Colli, R. Di Stefano, and F. Marignetti, "Modeling and control of a zero-current-switching DC/AC current-source inverter," IEEE Trans. Ind. Electron., vol. 54, no. 4, 2106-2119, Aug. 2007. S. Suroso and T. Noguchi, "Multilevel current waveform generation using inductor cells and H-Bridge current-source inverter," IEEE Trans. Power Electron., vol. 27, no. 3, pp. 1090-1098, Mar. 2012. S. Suroso, T. Noguchi, "Common-emitter topology of multilevel current-source pulse width modulation inverter with chopper-based DC current sources," IET Power Electron., Vol. 4, no. 7, pp. 759-766, Aug. 2011. S. Suroso, T. Noguchi, "A single-phase multilevel current-source converter using H-bridge and DC current modules," Int. J. Power Electron. Drive Syst. (IJPEDS), vol. 4, no. 2, pp. 165-172, Jun. 2014. R. Balasubaramanian, K. Parkavi Kathirvelu, and R. Amirtharajan, "Analysis of a multi level current source inverter: a critic based of various PWM strategies," Res. J. Inform. Technol., vol. 6, no. 3, pp. 166-177, 2014. J. Bao, W. Bao, and Z. Zhang, "Generalized multilevel current source inverter topology with self-balancing current," J. Zhejiang Univ.-Sci. C (Comput. & Electron. ), vol. 11, no. 7, pp. 555-561, 2010. Z. Bai, X. Ruan, and Z. Zhang, "A generic six-step direct PWM (SS-DPWM) scheme for current source converter," IEEE Trans. Power Electron., vol. 25, no. 3, pp. 659-666, Mar. 2010. M. F. Naguib and L. A. C. Lopes, "Minimize low-order harmonics in low-switching-frequency space-vector-modulated current source converters with minimum harmonic tracking technique," IEEE Trans. Power Electron., vol. 24, no. 4, pp. 881-893, Apr. 2009. J. I. Guzman, J. R. Espinoza, L.A. Moran, and G. Joos, "Selective harmonic elimination in multimodule three-phase current-source converters," IEEE Trans. Power Electron., vol. 25, no. 1, pp. 44-53, Jan. 2010. W. Liqiao, W. Yong, "Multilevel current source converter based on SHEPWM," in Proc. ICEMS, 2008, pp. 1905-1908. D. Xu and B.Wu, "Multilevel current source inverters with phase-shifted trapezoidal PWM," in Proc. PESC, 2005, pp. 2540-2546. B. S. Dupczak, A. J. Perin, M. L. Heldwein, "Space vector modulation strategy applied to interphase transformers-based five-level current source inverters," IEEE Trans. Power Electron., vol. 27, no. 6, pp. 2740-2751, Jun. 2012. M. P. Aguirre, L. Calvino, and M. I. Valla, "Multilevel current-source inverter with FPGA control," IEEE Trans. Ind. Electron., vol. 60, no. 1, pp. 3-10, Jan. 2013. N. Binesh and B. Wu, "5-level parallel current source inverter for high power application with DC current balance control," in Proc. IEEE International Electric Machines & Drives Conference (IEMDC), 2011, pp. 504-509. Z. Bai; H. Ma; D. Xu, and B. Wu, "Control strategy with a generalized DC current balancing method for multimodule current-source converter," IEEE Trans. Power Electron., vol. 29, no. 1, pp. 366-373, Jan. 2014. S. H. Hosseini, M. Farhadi Kangarlu and A. Khoshkbar Sadigh, "A new topology for multilevel current source inverter with reduced number of switches", in Proc. ELECO, 2009, Turkey, vol. I, pp. 273-277. 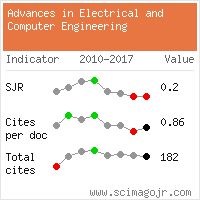 Citations for references updated on 2019-04-23 11:03 in 239 seconds.